Take Hands Four, Give Weight, Balance the Circle, Swing your Partner, DoSi-Do - all of these are dance instructions for old time dancing. 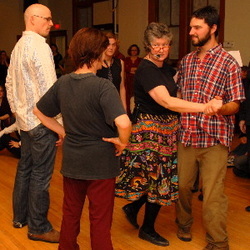 Old Time Dances such as Squares, Circles, Contras, English all require connection, cooperation and collaboration to create a wonderful dance experience. Country Dancing is an activity that everyone can enjoy in an evening or an afternoon. Lorraine has been creating wonderful fun in the form of community dances for over twenty years. Country dancing has three critical components: a great band, an experienced caller and enthusiastic dancers. The caller (Lorraine) teaches each dance to the dancers and then they dance to the music. Participants need have no previous country dance experience. Knowing your left hand from your right hand and the ability to count to eight are all that is required. A great country dance is smiles all round the room, bodies moving in space, great music and energy flowing. Does life ask you to dance? And what do you say..
"Not just right now....or later I may?" Just get up and Dance !! "The kids are still talking about it! We all had a blast!"